The nuclear fuel cycle is the process of turning uranium ore—hard rock or sandstone containing significant quantities of uranium—into electricity and re-processing or disposing of the leftover materials. The process is a lengthy and labor-intensive one requiring many steps. The primary step, of course, is extracting natural uranium from the rock in which it occurs. There are three established methods for doing so: open-pit mining, underground mining, and in-situleaching. In-situ leaching is only a viable option for porous rock types, like sandstone. It entails pumping a leaching liquid underground through uranium-bearing rock to dissolve the uranium; the uranium-bearing solution is then pumped back above ground and processed. In an open-pit or underground mine, the ore is blasted out and handled with heavy equipment. The ore is then transported to a mill, typically located close by the mining site, for further processing. It is in the mill that uranium is chemically removed from the rock bearing it. Uranium in rock may be compared to sugar in a cookie. It is easy to detect sugar in a cookie; just taste the cookie. It is likewise easy to detect uranium in rock; one may measure the radiation associated with uranium and analyze the rock in a lab. However, just as it is hard to extract sugar from a cookie, it is hard to separate uranium from the rock through which it is dispersed. It cannot, like coal or silver, be chipped away from the rock which surrounds it or removed in seams; it must be chemically separated. The chemical separation, which occurs in the mill, entails crushing up the ore, adding water to it, pressurizing it, heating it up, and altering its pH. This process forces the uranium into a solution, from which the uranium is then precipitated. 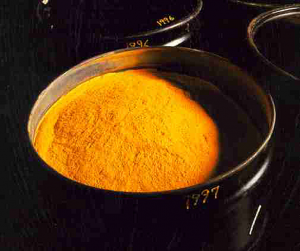 The natural uranium, or yellowcake, is dried and shipped in 55-gallon steel drums to other processing facilities. The tailings, the crushed rock left over after the uranium has been removed, are disposed of on site. In the form of yellowcake, natural uranium goes through three additional processing steps before it is ready to be inserted into a nuclear reactor: conversion, enrichment, and fuel fabrication. First, it must be converted to uranium hexafluoride (UF6), which is crystalline at room temperature but a gas at high heat. The only plant which conducts this process in the U.S. is located in Metropolis, Illinois. Second, the uranium undergoes enrichment, the process during which the percentage of the isotope U-235 is increased. In the U.S., this takes place at Paducah, Kentucky, and Eunice, New Mexico. Third, fuel fabrication, during which the uranium is formed into fuel pellets to be inserted into the reactor, occurs at a number of American facilities. Babcock & Wilcox in Lynchburg, Virginia, for example, currently fabricates fuel for the reactors powering the U.S. Navy’s submarines and aircraft carriers. AREVA, also located in Lynchburg, has conducted fuel fabrication. After fuel fabrication, the uranium is ready for a nuclear reactor. Virginia has four nuclear reactors at North Anna and Surry. 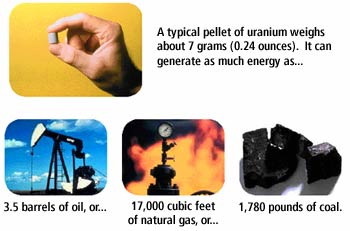 A fingertip-sized fuel pellet of commercial grade will produce the same amount of energy as 149 gallons of oil or a ton of coal. The spent (used) fuel, which is extremely hot once removed from the reactor, is cooled down at the reactor site and then stored. After uranium has been fissioned in a reactor, it may be re-processed so the residual uranium remaining in the fuel can be recovered. There are currently no facilities re-processing spent fuel in the U.S. The volume of waste is very small; all of the spent fuel in the U.S. could fit in a pit 30 feet deep and as wide and long as a football field. To read more about the nuclear fuel cycle, visit the websites of the Nuclear Regulatory Commission and Cameco.